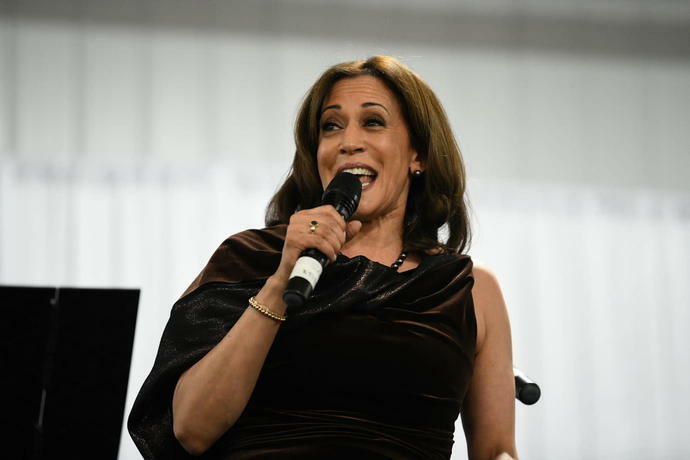 OAKLAND, Calif. (AP) - Democratic presidential candidate Kamala Harris says she's the kind of leader who can unify the country and would fight for the needs of all Americans. The first-term California senator, who announced her candidacy on Monday, planned a speech at a rally in Oakland, her hometown, later Sunday, as she outlines her campaign and introduces herself to the nation. "I'm running for president because I love my country. I'm running to be a president by the people. Of the people. For all the people," according to prepared remarks obtained by The Associated Press. The appearance at a plaza outside City hall was intended to portray her candidacy as the latest chapter in a lifetime of advocating for all people and to promote a message of unity. She began her career as a prosecutor in Oakland and later became California's attorney general. "My whole life, I've only had one client: The people," Harris says in her prepared remarks, echoing the words she has used in courtrooms and has adopted as her campaign's slogan. Harris, the daughter of immigrants from Jamaica and India, has drawn deeply from symbolism as she has rolled out her campaign. She entered the race on Martin Luther King Jr. Day. Campaign aides say she has drawn inspiration from Shirley Chisholm, who in 1972 became the first black woman to run for president from a major party. In her Oakland speech, Harris says she sees this year as an "inflection point" in American history and that she is best positioned to unite a divided country. After the rally, Harris planned to her first trip to Iowa as a presidential candidate. In the weeks before last November's elections, Harris traveled to the leadoff caucus state to campaign on behalf of Democrats, and also visited other early-voting states. Harris's campaign will be based in Baltimore and led by Juan Rodriguez who managed her 2016 Senate campaign. Aides say the campaign will have a second office in Oakland. Sanders' position puts him at odds with two of his rivals in the nomination race, Senators Elizabeth Warren of Massachusetts and Kamala Harris of California, as well some members of the party's progressive wing. Speaking at a CNN town hall event in New Hampshire, the Vermont senator said the report by Special Counsel Robert Mueller shows that Trump is "the most dangerous president in the modern history of our country,'' but added that the most important goal is making sure he's not re-elected. The California Democrat's proposals to bypass Congress with actions that include expanding requirements for background checks and revoking licenses for gun manufactures and dealers found to have broken the law would almost certainly face legal challenges. "Upon being elected, I will give the United States Congress 100 days to get their act together and have the courage to pass reasonable gun safety laws, and if they fail to do it, then I will take executive action," Harris said Monday night at a town hall event hosted by CNN in New Hampshire, site of the first primary in the 2020 nomination contest.